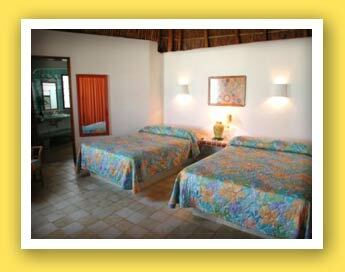 Welcome to Hotel Las Palapas! Hotel Las Palapas situated in Playa del Carmen, Riviera Maya is a beachfront resort hotel with beach bungalows, tropical garden palapas, ocean view hotel rooms, water front cabanas, swimming pool, restaurants, Scuba Diving and it located on the best beach of Playa Del Carmen, Riviera Maya, Mexico. White sand beaches, breezes sweeping through the palm trees, emerald green Caribbean waters... at Hotel Las Palapas, we make your vacation dreams come true! 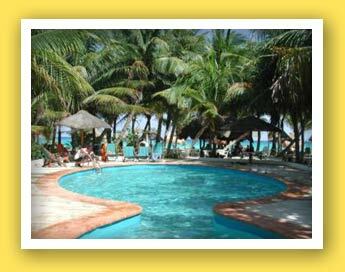 The hotel is located just a few steps of 5th avenue, the main street in playa del carmen. 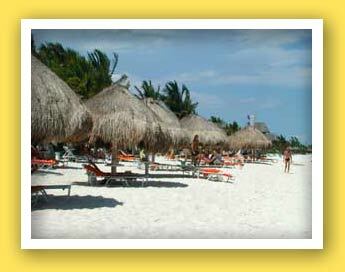 Here you will find shopping, restaurants, bars and all sort of other things to do and hundreds of activities. Nature has treated Las Palapas with kilometers of sand beaches, with the turquoise, crystal clear water of the Caribbean, and with abundant tropical vegetation. In this wonderful environment we offer you a paradise of relaxation and tranquility where you can get away from it all and leave the pressures of everyday life behind. 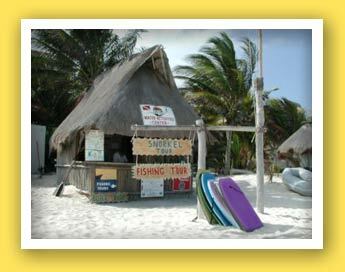 You will also find the best scuba diving school in playa del carmen Diving Playa Del Carmen. Just imagine relaxing in your hammock, finally reading the book you've always wanted to read. Or lying on the beach, in the shade of a palapa, listening to the sound of the ocean and finding yourself in another world. We can offer you a relaxing and amazing vacation that you can brag about to your friends when you get back home, but in the mean time let us make Las Palapas your home away from home in Playa del Carmen. 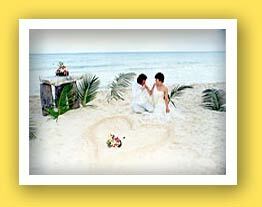 We will make sure that the most special day of your life is perfect! Of course you will spend much time on our pristine white sand beach and enjoy the breeze, the sun and the crystal clear waters of the Mexican Caribbean. 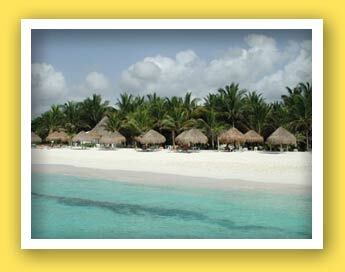 At Hotel Las Palapas you will have the most relaxing Mexican Caribbean vacation you can imagine. All our rooms are surrounded by our lush tropical gardens, and some of them even by the best white sand beach in Playa del Carmen! 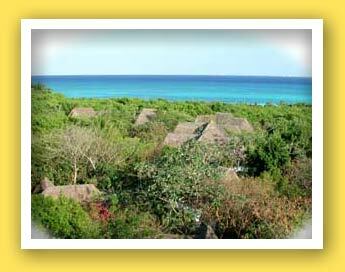 7 beachfront bungalows with thatched roofs, situated directly on the white sand beach. 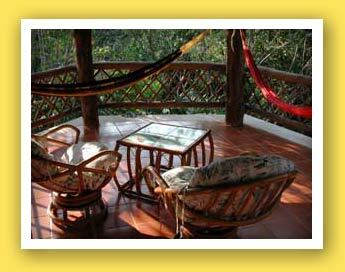 Equipped with 2 queen size beds, ceiling fan, bathroom with shower and private verandah with hammocks and armchairs. 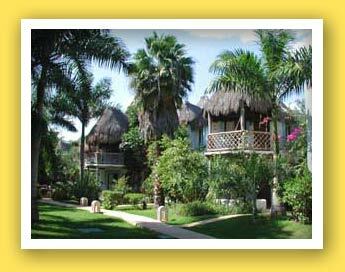 48 standard hotel rooms in one or two story bungalows, all with lovely views of our garden. The hotel rooms in the one story bungalows as well as the upper floor rooms of the two story buildings have thatched roofs. 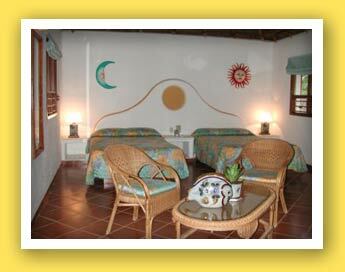 Equipment and size of the standard rooms are equivalent to the beachfront rooms. Some of the rooms have air conditioning. 20 garden deluxe rooms in one or two story bungalows, located in a natural tropical environment in the quietest part of the hotel. These hotel rooms have an additional sitting area with sofa bed and are considerably larger than the beachfront and standard rooms. 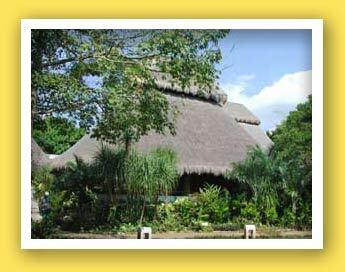 The rooms in the one story bungalows as well as the upper floor rooms of the two story buildings have thatched roofs. In order to provide for you an atmosphere of total peace and tranquility, our rooms have not been equipped with telephones or TV's. Some rooms have air conditioning and mini bar (available on request). 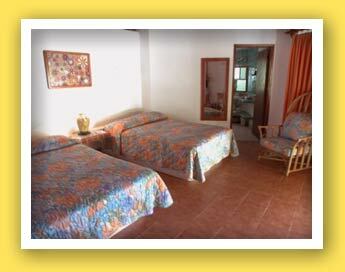 We call our rooms "cabañas". In the main restaurant you start your day with a rich breakfast from the buffet. 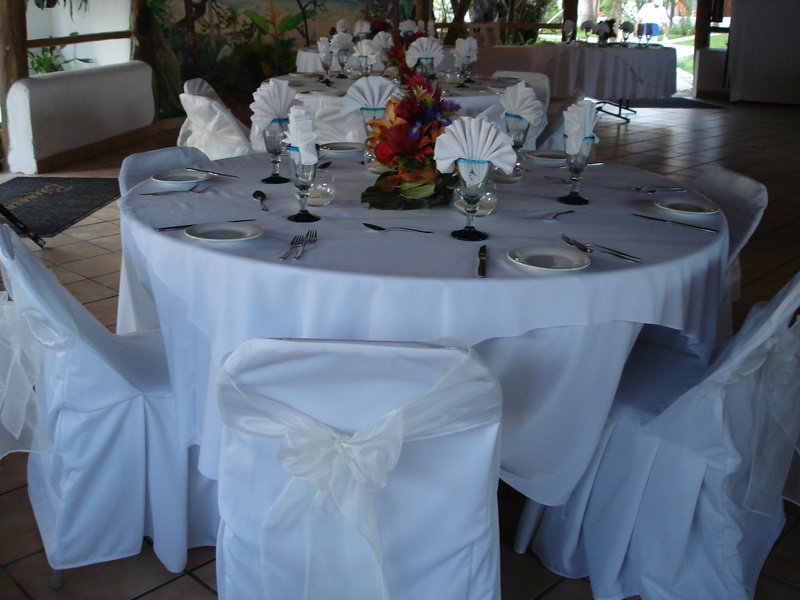 Dinner is a four meal course with a selection of two International dishes or Mexican. 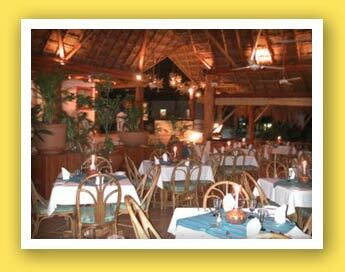 Three times a week dinner is served buffet style with specialties from the Mayan, Caribbean and Mexican kitchens. 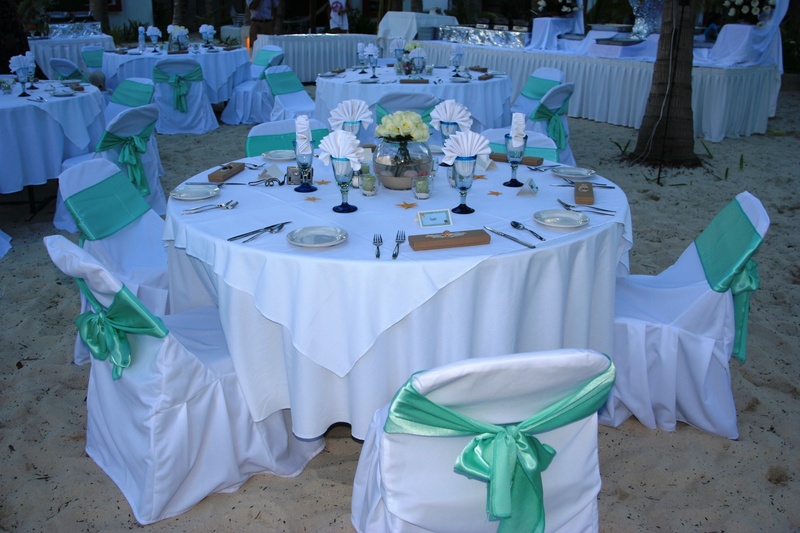 On Wednesdays, the buffet is served on the beach (weather permitting). On Saturdays, we serve our most popular buffet: The Fiesta Mexicana, accompanied by a Mariachi band. Lunch is served in our "Casa Club", the Club House. On the menu there are delicious international and Mexican dishes and snacks, and the little ones can choose from their own kid's menu. The bar at "Casa Club" serves exotic cocktails, cold beers and non-alcoholic beverages until midnight. A wide range of board games, billiards, table tennis and a library are provided for you to use. We don't need to be very descriptive about this one. Come and enjoy your drinks or lunch on the beach. 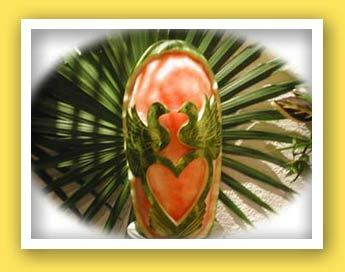 Our bartenders will surprise your with some wonderful Mexican drinks. Also you can enjoy the wonderful ocean view. 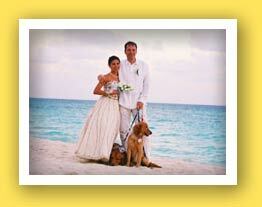 from the blue waters of the Caribbean Sea to the sparkling sand beaches of this Mexican paradise. 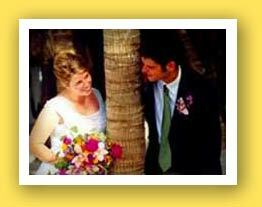 To Quote Your Wedding for this Venue, click HERE. You need to Login first.